Austrian investment companies exchange their fund data with authorised users and supply regulatory reports to the Oesterreichische Nationalbank, the central bank of the Republic of Austria, via the electronic platform OeKB Fund Data Portal using the international standardised FundsXML interface format. 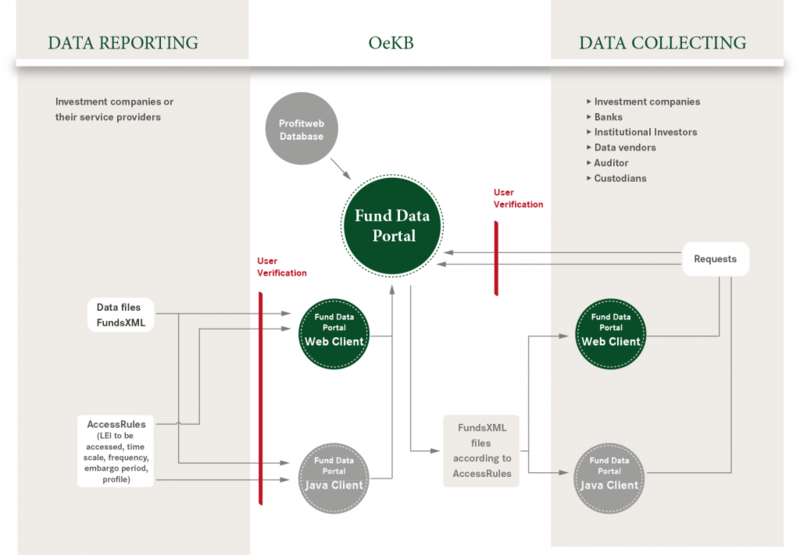 The “Fund Data Portal” is hosted by Oesterreichische Kontrollbank AG (OeKB) – a specialised institution owned by commercial banks located in Austria. OeKB’s electronic platform gives investment companies the opportunity to supply partners like banks, data vendors, other investment companies or investors with fund data and in turn to receive fund data from other investment companies. All Austrian investment companies are connected to the Fund Data Portal, data exchange is also possible between international investment companies. Due to a complex authorisation system (“access rules”), data sovereignty remains with the investment company. Scope and recipients of data as well as time delays can be set individually for each addressee. The “Fund Data Portal” offers two technical ways of using the system: The upload and download of FundsXML documents (or access rules) via a webclient or for automized operations via a Java client.